RT:Kurds don't like the Baghdad government and have long wanted it gone. Why would Washington and Britain try and change their deep-seated position now? RT:Suppose the Kurds did help the Maliki government this time. What's in it for them? What would they expect in return? And what is Kerry hoping for? MM: He is hoping that Maliki would agree to a more all-inclusive government, but Maliki has already announced that he is not going to do that. On top you have the Sunnis who are very upset with him over a period of time in which he has been ruling. So I think Kerry is just like too little too late, and he is coming at the 11th hour and we are long past that. Unless something miraculous happens in the parliament in Baghdad in which they choose a different Prime Minister, which probably may not happen, and with Maliki staying on board, the splitting up of Iraq is going to be inevitable. RT:How strong is Maliki's position in the region? MM: I think it is weakening by the day. He has lost much of his territory, he does not have the support of the other elements within, he certainly has no support from the Sunnis and the Kurds of course, whether they work politely with him they have their own national interests in mind and I think that is what they are going to pursue. Maliki probably can control the Shia portion of Iraq but this is going to change the whole complexion of Iraq. In the meantime, you have the ISIS that will be moving right along, they have not been fighting that much with the Kurds because they are Sunni as well, but I think ultimately the ISIS will consolidate all the other Sunni portions of the country and Maliki is not in a strong military position to take it back. ISIS is threatening military bases there that the Iraqi military relies upon and given their track record to date in dealing with ISIS, they may cut and run just as they did before. And all that equipment including aircraft, helicopters, and other military equipment could easily be turned over to ISIS. At the Balad air base we were to base F-16s there, if they take this base over, it’s a question of what military strength Maliki will have [left]. RT:The Kurds in Iraq are sitting on an estimated 45 billion barrels of oil in their territory. Exxon Mobil, Chevron and Total are doing big business there. So how come the Kurds haven't been more successful in getting their way? And what’s next for them? MM: I think that Kurds will probably pursue their own interests. 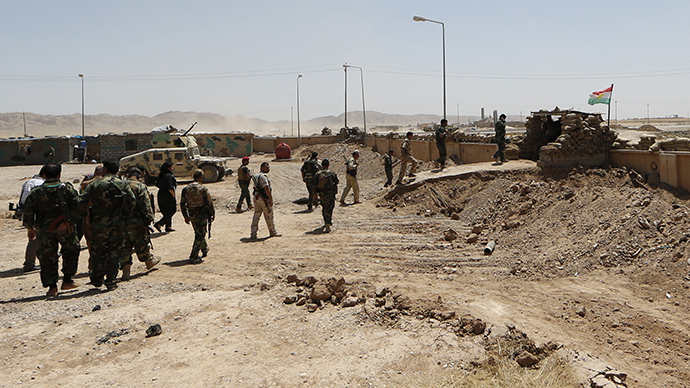 The Peshmerga, their militant force, has been successful in holding up the ISIS advances. But there is oil there and ISIS may ultimately attempt something, but I think the Peshmerga is going to resist that. There is much more unification among the Kurds than anywhere else, and it could be difficult for ISIS to do this. It will be easier for ISIS to head west and go into Jordan and Southern Turkey and consolidate those positions to enhance its caliphate it is building upon. And ultimately of course it has got its eyes on Lebanon, so it is a tremendous concern there as well about ISIS and merging with Al-Nusra. So you are seeing a lot of these forces. The only thing that is working in anybody’s favor is that the ISIS has a military capability but the question is whether they will be able to govern all that territory that they have taken over and already they are fighting from within with some of the units, some of the other Islamist groups, even ex-Baathists that joined them temporarily to take the territory over. Now there has actually been gunfire in opposition. Each [one] will want their own little chunk, little piece. It’s a mess.